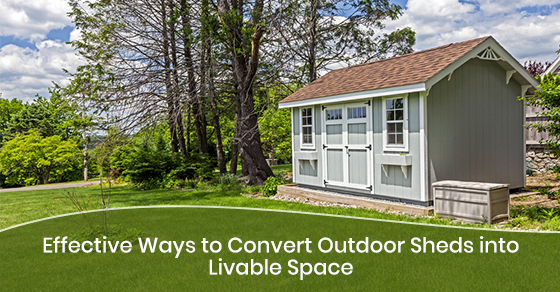 Your outdoor shed is not just a place to store garden tools and seasonal items. It is one of the most versatile spaces in your home, one that can be designed to create a functional and attractive living space for a growing household, or for many other purposes. With a firm base, damp-proofing, power, ventilation, and a heating system, your outdoor shed can be transformed into a safe and cozy room that can be used as a home office, music room, or anything else that you need extra space for. Before starting any work on your outdoor shed, you should first evaluate its current condition, including the foundation and walls, to ensure that you’re working on a strong and stable structure that will last for years. Make any necessary repairs, and move the shed to better ground if needed. Next, determine what the space will be used for, and then identify the items needed to fulfil that function. For instance, the design and furniture for a home office will be different from that needed for a man cave or workshop. When making your application for these permits, you should provide copies of your site plan, building plan, and the names of any contractors that you’ll be working with. Please consult your local authorities for the proper standards and legal requirements in your area. Before starting any work, inspect the walls, roof, windows and doors of your shed for cracks, and seal any that you find up. You may also need to break out the caulk and weatherstripping to make your shed airtight and prevent vermin from making a home in your shed, and cold draughts stopping you enjoying the space. Depending on the size of your budget, you can install foam insulation boards on your floor. Alternatively, you can use a breathable membrane and top it with durable flooring, rug, or carpet off-cut. The membrane will prevent any underground moisture from penetrating into your shed. There are two common options for protecting your ceiling. You can use the same glass and mineral wool material used on your walls, or natural insulation like hemp or sheep’s wool. Both options are sustainable, flexible, and easy to install, plus they’re breathable, which makes them effective for damp prevention. Remember to leave some space between the roof and insulation for air circulation and to allow moisture to escape. Applying weatherproofing plastic to windows. It is best to maximize natural lighting during the day. Installing skylights and windows will not only brighten your space and reduce lighting, heating, and cooling costs, but also facilitate air circulation and ventilation for optimal comfort. Adding a fresh coat of paint inside your shed will instantly brighten the space. White paint, for instance, will improve lighting for a workshop. You can also hang pictures, posters, and other decorations to make your new space suit its purpose. Make sure to coat the exterior with wood treatment or paint. You could also add plants, such as vines that will crawl up the outside walls and make the shed fit in better with the landscape. With your shed upgraded and now an eye-catching fixture in your yard, it will become an attractive target for thieves and intruders, especially if there are no obvious security measures. You should keep the shed door closed when not in use, invest in quality locks, and improve the security around your home and shed to deter intruders. Consider installing laminated glass that won’t smash when hit with a brick or hammer. Use blinds or curtains to hide your valuables to deter opportunistic break-ins. With careful planning, you can transform an old outdoor shed into your favourite living space. Make sure to add the right furniture for the shed’s purpose and use vertical storage to keep garden items and other tools. You can also install any essential amenities, including electricity, water, and heating and cooling to make it functional year round. For more information about transforming your shed, call In the Back Yard today at +1 813-242-2780 or contact us here.